Louise Marley was born Louise Campbell, August 15, 1952, in California, grew up mostly in the Bay Area, and attended the University of the Pacific in Stockton, where she got a B.A. in music. ''Then I studied folk music for a while.'' During a couple of years in Great Falls, Montana, she met Jake Marley, a captain in the Air Force. They married in 1975 and moved out to the Seattle area, where she received her M.A. in music at the University of Washington – ''and I've pretty much worked in music ever since then,'' singing with the Seattle Opera and in recitals. She taught voice, etc., for 11 years at Cornish College in Seattle, but left recently to devote her time to writing. The Marleys have a teenage son, Zach. She also had an interest in SF and fantasy from an early age, and attended Clarion West in 1993. 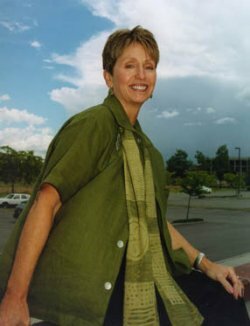 Her first novel, Sing the Light, appeared in 1995, and was followed by two more in a series featuring psionic Singers on an ice planet, Sing the Warmth (1996) and Receive the Gift (1997). Her most recent SF novel is The Terrorists of Irustan (1999). ''That book I was struggling with when I went to Clarion eventually became Sing the Light, and it ended up a trilogy. They're very much in the Anne McCaffrey tradition. The conceit is that singers have the power to focus their telekinesis, their telepathy, to make warmth and light for the people of an ice planet. The thing that surprised me was that I have a large YA following. I didn't intend that. The books were well received by my musical friends as well. ''For The Terrorists of Irustan, I changed what I did. I really didn't want to always write like Anne McCaffrey or Marion Zimmer Bradley, as much as I admire and love their books. I wanted to go off in a different direction, and my husband had a wonderful idea that I stole from him! We were on an airplane, and he read this article about what was going on in Afghanistan with women, and said, 'Wouldn't it be interesting if women who live in a society like that decided to rebel? How would they do it?' Before the plane landed, my mind was off and wandering. I just knew this was an idea I really wanted to work with. ''Wouldn't it be nice if a fiction writer could write a book that would actually change the mind of someone who was involved? The book doesn't work without the terrorism. But, on the other hand, my philosophical beliefs are that violence creates more violence. But if it were my child, or the child of a friend, being threatened, if I could figure out how to become a terrorist, I probably would. You pay a price – and my character does pay a price. ''Now I'm working on a book that's about music, but the SF element is medical science, brain stuff. It's called The Glass Harmonica. There's a lot of music because the instrument is the focus, the conceit of the novel. The book is set half in the 18th century, when it was invented, and then we always refer to it as the 'armonica,' which is what its inventor, Benjamin Franklin named it. It's musical glasses, played with a wetted finger you rub against the glass, that have been turned on their side and pierced with a spindle. Now it goes around on a motor, but in Franklin's day it was pumped on a foot-treadle like an old sewing machine. Because musical glasses had to be constantly refilled with water and re-tuned every time he played them, Franklin came up with this instead. The glass harmonica sustains the tone beautifully. It makes a really weird and ethereal sound. ''What's next? I'm cooking up a book about the first woman to play Major League baseball, which will be near-future science fiction, pursuing another passion of mine. I was very conflicted as a child, figuring whether I wanted to be a singer or a baseball player. Well, I always wanted to be a singer, but I was also very interested in playing baseball. I got talked out of it very early by my grandfather, who said, 'No, no, women shouldn't play baseball because you'll get your nose broken.' Now I'm conflicted over whether I should come back as a famous woman singer or as a woman baseball player!